Luv-It, This Time For Sure! When I was a graduate student, there were students in the same program who were from the East Coast. Those of us from Ohio were amused by the way those students referred to the soft stuff at Dairy Queen as “custard.” We insisted that “custard” was a baked dish with a lot of eggs in it. As it turns out, we were right, and we were wrong. The people from the East, however, were simply wrong. 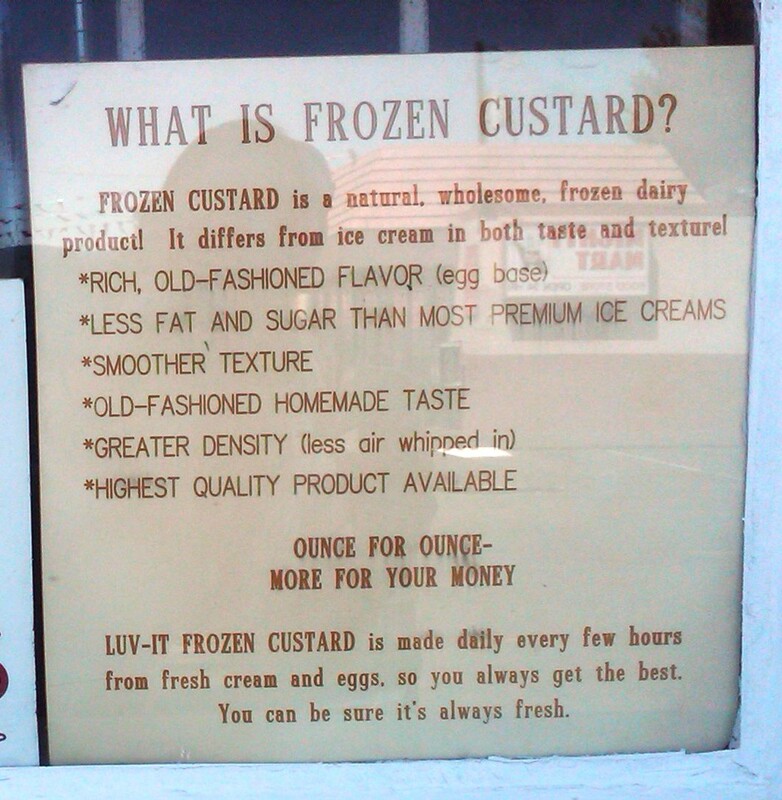 By “custard,” they meant to say “frozen custard,” which none of us hicks from Ohio had ever heard of. The thing is, soft serve ice-milk, or even ice-cream, is not, and never will be, frozen custard. This is a lesson I learned when, as I was working in downtown Minneapolis, a frozen custard stand opened in the skyway. Patrons wait for their orders from Luv-It Custard. One day, there it was, right on my way to lunch: a frozen custard stand. That stand provided information on the yummy confection, such as that it was first introduced at the Saint Louis World’s Fair in 1904, and that it had lots of raw egg yolks in it. Thus enlightened to the fact that frozen custard was, in fact, real, I had to try some. I was hooked on the first lick. From Minneapolis I moved to the Denver area, where there was, sad to say, no frozen custard for sale until a local chain of hamburger stands added it to their menu. That chain has expanded outside of Colorado in recent years, but not, alas, into Las Vegas. However, there is a shining beacon of custardy goodness that has been in Las Vegas since 1976! 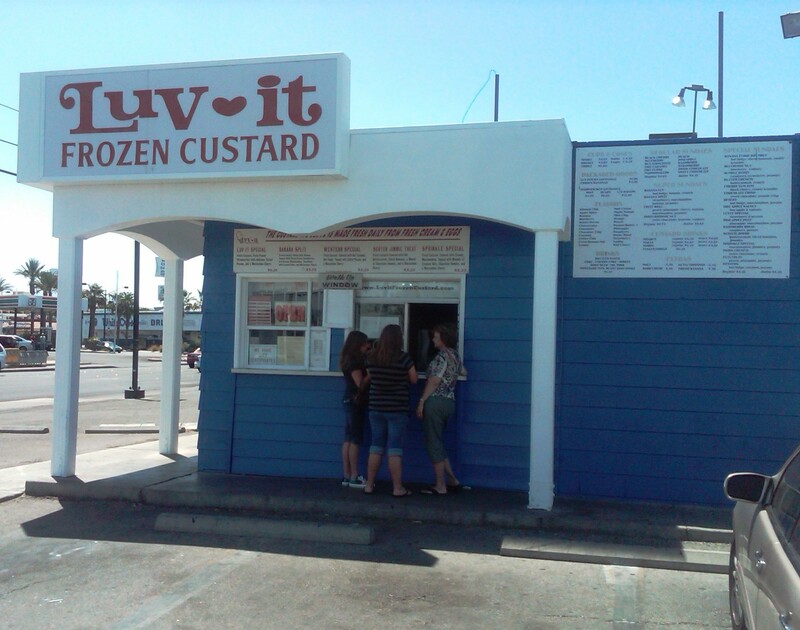 I refer, of course, to Luv-It Custard, on Oakey, just East of Las Vegas Boulevard. The sign, pictured here, says what Luv-It wants to say about frozen custard versus ice cream. I can tell you that, so far as I can tell, frozen custard is what ice cream aspires to be, but can never quite reach. It has a smooth, creamy texture combined with a taste enhanced by all those eggs that is just out of this world. Pretty much each weekend Tami and I find an excuse to drop by Luv-It. I usually get a double chocolate cone, but there are always several other flavors available. Well, okay, when they first open there may be fewer flavors, because most flavors of custard are based upon vanilla, which gets made first. Be aware that not every flavor is available every day. A schedule of flavors and days is posted on the store and on their web site. Luv-It has won numerous awards including, of course, the Review-Journal’s annual “Best of” readers’ choice for, and this may not be entirely fair, “best ice cream.” It’s better than ice cream, but of course it’s the only frozen custard in town, so there’s really no contest. They have also won awards from many other sources, as you can see listed on their web site, or on the front window of the store. Once you try their product, you’ll agree that they deserve every single award they’ve received, and probably a few more. So there you have it. My friends and I were wrong about custard. Not that you can’t make a baked custard, which of course you can, but we were ignorant of the flavorful bliss that is frozen custard. You can’t just buy frozen custard any where. You can’t get it on the Strip, for instance. 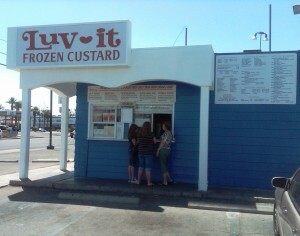 But, for someone who happens to live in Las Vegas, you can buy some any time you want, at Luv-It Custard. If you’re from out of town and want to try some, you’ll find Luv-It next door to the Olympic Garden. Hey, everybody knows where the Olympic Garden is, right? I learn new things just about every day on this site — I didn’t know about Luv-It Custard before! Gotta go try this! Wow, Steve! I had no idea. I thought “frozen custard” was just an Eastern term for ice cream. Thanks for your post — I luv-it. Steve, nice review, but you need to get the facts straight. There are 3 more Frozen Custard shops in Las Vegas–Sheridan’s in Henderson, Neilsen’s, also in Henderson (both on Eastern Ave, just a mile or so apart), and Create Burgers & Frozen Custard near North Las Vegas. I do not represent any of them, I am just a die-hard frozen custard fan originally from St Louis. Yes, Luv-It is the oldest, their vanilla is quite good, but Neilsen’s is excellent too, and their chocolate has a better flavor than Luv-It. Both shops do have excellent vanilla, comparable to the great midwest custard stands. Also, the frozen custard machine was invented in 1919 by Kohr Bros at Coney island, NY. The machine is what makes the Extruded Frozen Custard that you refer to here (as opposed to cheap soft-serve versions). After all, the French were the first to add eggs to a vanilla ice cream recipe hundreds of years ago! That, technically, was the world’s first frozen custard, as far as recipe goes.The 1904 St Louis World’s Fair was where, supposedly, the ice cream CONE was invented. Please update your story with these facts. I think you just updated the article! Comments from readers carry equal weight around here, so thanks for the good intel. As for me, my frozen custard of choice will remain Ted Drewe’s Frozen Custard in St. Louis, Missouri….